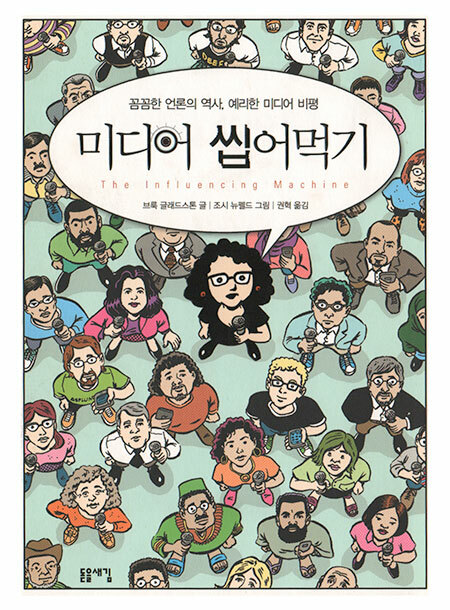 Just for poops & chuckles, I thought you’d like to see the cover of the Korean language edition of The Influencing Machine, published by Doddle Saeghim. They took the art from the last page (with Brooke’s head blown up a bit) and colored it—in a much louder style than I use in the book itself. They also added a bunch of shadows. 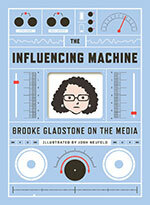 Influencing Machine featured on 1book140 (The Atlantic.com's Reading Club)—Twitter convo tonite! 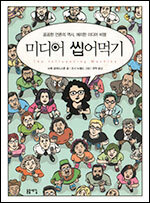 This month The Influencing Machine is one of two graphic novel’s being read on 1book140, The Atlantic.com’s Reading Club. And tonight at 7pm EST, writer Brooke Gladstone and I will be taking part in a live Q&A via Twitter. Please join in the conversation! 1book140 has been running since May of 2011 and they’ve read & discussed works by living authors and by dead authors; they’ve read thrillers, mysteries, beach reads, science fiction, poetry, history, and travel writing. Some of the previous entries from the 1book140 reading list include Margaret Atwood’s The Blind Assassin, Haruki Murakami’s Kafka on the Shore, Joe Hill’s Heart-Shaped Box, Kurt Vonnegut’s Slaughterhouse Five, P.G. Wodehouse’s Right Ho, Jeeves, Charles Dickens’ David Copperfield, Umberto Eco’s The Name of the Rose, Lev Grossman’s The Magicians, Ray Bradbury’s Something Wicked This Way Comes, China Mieville’s The City & the City, Patti Smith’s Just Kids, John Green’s The Fault in Our Stars, F. Scott Fitzgerald’s The Great Gatsby, and Adam Johnson’s The Orphan Master’s Son. And they’ve even read comics before, including Scott McCloud’s Understanding Comics, Art Spiegelman’s Maus, Alan Moore & David Lloyd’s V for Vendetta, and Neil Gaiman & Sam Keith and Mike Dringenberg’s Sandman Volume 1: Preludes and Nocturnes. 1book140 is currently being run by J. Nathan Matias, and the process seems very democratic. Books are nominated on by readers and the finalists are voted on in online polls. And now, after some runoff voting (against very esteemed competition), The Influencing Machine—along with Chris Ware’s masterwork Building Stories—has emerged as this month’s 1book140 selection! The first two weeks of August were spent on Building Stories and now it’s our book’s turn. Tonight from 7-8pm EST, Brooke & I will be sitting by to answer any and all questions related to our collaboration. To join in, tweet your question to #1book140; we’ll do our best to respond! 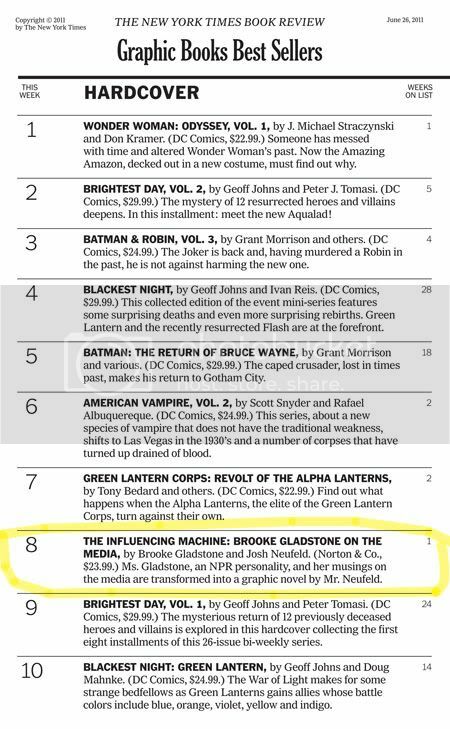 Next Tuesday, May 8, Brooke Gladstone and I will be debuting The Influencing Machine‘s paperback edition at Greenpoint’s independent bookstore WORD. Titled “Brooke Gladstone and Josh Neufeld Explain Everything,” Brooke and I will “dish” on the state of modern media, the process of creating the book, and more with a multimedia presentation, Q&A, and signing. Plus, WORD will be raffling a free, signed copy of the book! Tuesday, May 8, 7 p.m.
For The Influencing Machine paperback cover, my publisher went in a very different direction, but it’s definitely eye-catching. 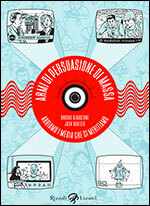 For comparison’s sake, here’s the hardcover design. Thoughts? The paperback debuts May 8. 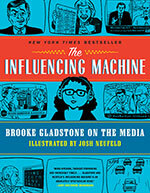 Dinesh Ramde of the Associated Press has reviewed The Influencing Machine, which means his review is wending its way through the nation’s newspapers and media venues. (It’s already appeared in the Washington Examiner, Newsday, and on ABC News’ website.) It’s a nice review, though he actually faulted my drawings for possibly being "so good they distract from the content of the book"! 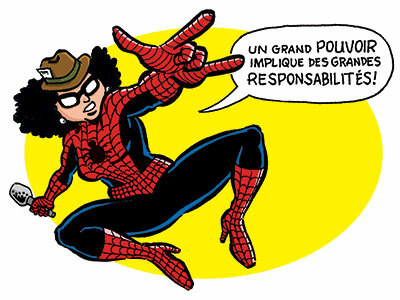 He goes on later to write, "While animation in comic books might provide context that adds to the action, these drawings sometimes provide humor or eye candy that draws enough attention that the reader has to reread the previous dialogue bubble to return to Gladstone’s train of thought." Still, Ramde writes, "Distractions aside, Gladstone still tells a compelling story. It’s easy to imagine The Influencing Machine becoming mandatory reading in journalism classes around the country." That would be nice!